On May 27th, 1784, Wolfgang Amadeus Mozart met a flirtatious little starling in a Viennese shop who sang an improvised version of the theme from his Piano Concerto no. 17 in G major. Sensing a kindred spirit in the plucky young bird, Mozart bought him and took him home to be a family pet. For three years, the starling lived with Mozart, influencing his work and serving as his companion, distraction, consolation, and muse.Two centuries later, starlings are reviled by even the most compassionate conservationists. A nonnative, invasive species, they invade sensitive habitats, outcompete local birds for nest sites and food, and decimate crops. A seasoned birder and naturalist, Lyanda Lynn Haupt is well versed in the difficult and often strained relationships these birds have with other species and the environment. 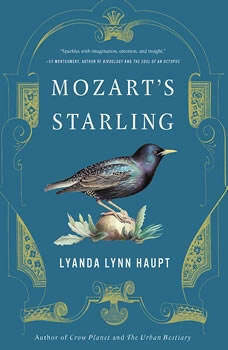 But after rescuing a baby starling of her own, Haupt found herself enchanted by the same intelligence and playful spirit that had so charmed her favorite composer.In Mozart's Starling, Haupt explores the unlikely and remarkable bond between one of history's most cherished composers and one of earth's most common birds. The intertwined stories of Mozart's beloved pet and Haupt's own starling provide an unexpected window into human-animal friendships, music, the secret world of starlings, and the nature of creative inspiration. A blend of natural history, biography, and memoir, Mozart's Starling is a tour de force that awakens a surprising new awareness of our place in the world. The Wonder of Birds illuminates qualities unique to birds that demonstrate just how invaluable they are to humankind—both ecologically and spiritually. In this New York Times bestseller, a naturalist probes the forest to comprehend the secret lives of owls. Beaks, Bones, and Bird Songs guides the listener through the myriad, and often almost miraculous, things that birds do every day to merely stay alive.